Tribune Co. stock has fallen 3.3% since the Chandler family bitterly launched an effort seven months ago to lift the value of their holdings by trying to force the breakup of the company. 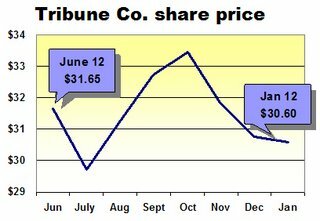 As if the potential insult of no takers were not injury enough, Tribune’s shares on Friday closed at $30.60 a share, or 3.3% less than on June 12, the day before the Chandlers went public with their demand that the management sell some or all of the company. The Tribune effectively was put in play when the Chandlers, who gained 20% of the company upon the sale of their Times Mirror Co. in 2000, aired their lack of confidence in Tribune management in an unusually blunt filing with the Securities and Exchange Commission on June 13. The Chandlers had a point, given that Tribune’s shares had peaked at $51.99 as recently as February, 2004. If they had been paying attention, however, they would have noticed that the market for media companies had changed a lot since then. Although breaking up a company often is a good way to lift the value of its shares, the Chandlers picked the wrong industry at the wrong time. They should have known better, too, in light of the so-so response to the sale of Knight Ridder, which was reaching its denouement at the moment they fired their provocative missive to SEC. The price of McClatchy’s stock dropped the instant it announced its intention to acquire what subsequently turned out to be two-thirds of KRI. Since then, the stock has fallen 22.6% to close Friday at $41.19 a share. If no third-party materializes this week with a compelling bid for Tribune, management has a chance to take the company private by rounding up the financing necessary to purchase the shares of the Chandlers and the other public investors. As a private company, Tribune could neatly avoid truculent investors and the vagaries of a stock market that in recent years has turned decidedly hostile to media companies. But its executives would exchange those burdens for stringent new operating objectives that likely would require them to increase revenues and cut expenses even more than they have been able to achieve in recent years. So far, the only folks making any money on the Tribune’s tribulations are the platoons of lawyers and investment bankers hired by the various parties to advance and protect their respective interests. The shareholders who were supposed to benefit from all the high-flautin’ high finance are deeper in the hole than before this got started.